Susarma (Susharma / सुशर्मा) was king of Trigarta, who vowed to to either die or kill Arjuna as part of a larger plan by Duryodhana to capture Yudhishthira alive in Kurukshetra war. For this, he formed a suicide squad on 11th night of the war. Multan was the capital of Trigarta with its original name that is Mulasthan. The territory of Trigarta Kingdom is around the three rivers of Satluj, Beas, and Ravi. These Trigarta kings were allies of Duryodhana and enemies of Pandavas and Viratas. Their capital was named Prasthala (modern day Jalandhar, Punjab). Their kingdom extended from Mulasthana (modern day Multan, Pakistan) to Kangra in Himachal Pradesh. When Duryodhana had a doubt that Pandavas must be hiding in Matsya Kingdom, during their exile period, Susharma joins them during that attack. Duryodhana was also prompted by death of Keechaka, which gave him a hint of Bheema being present in capital of Matsya Kingdom, Viratanagar. Susharma had plans of settling his score with Virata King, as he suffered a lot in the hands of Keechaka during past. Duryodhana asks Susharma and Dussasana to attack from South entrance of the fort, while kaurava army attacks from north entrance and sandwitches matsya army. Next day, Susharma attackd south door and managed to take control over a large territory and also huge cattle. Virata King lacked confidence in war, after death of Keechaka. 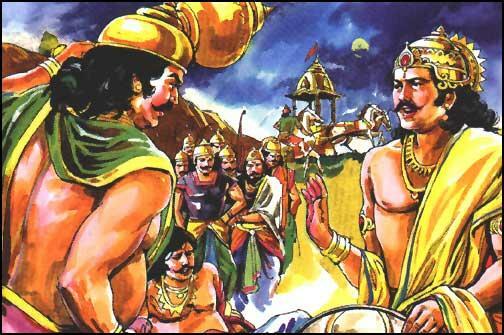 But Kanka (Yudhishthira in disguise) assured King that he will assist them in war. His words instilled confidence in king and Kanka requested for few more of his associates to accompany him to the war. Yudhishthira called up his brothers, who were in disguise and asked them to get ready for war as they were supposed to protect the kingdom, which gave them shelter for an year. Except for Arjuna (in female disguise as Brihannala), all others joined Kanka for war. It was a well fought war till sunset. Kauravas were shocked to see a small matsya army fighting extremely well. They could not recognize Yudhishthira in disguise, who was leading them. After sunset, Susharma played a trick and captured Virata King alive. Their army ran to Kanka for help. Kanka ordered Vallabha (Bheema in disguise) to get the king released. Vallabha attacked Susharma’s chariot and broke it down. Both Susharma and Virata King fell down. Seeing this oppurtunity, Virata King snatched Susharma’s sword and cleared his way back to his own army. Susharma tried to flee, but Bheema captured him and he was about to kill him, Kanka came over there and asked to leave Susharma alive with minor punishment. Bheema slapped Susharma and made him fall on knees and beg for mercy before letting him go. Virata King appreciates Kanka and offers Keechaka’s territory for him. Listening to this defeat and insult of Susharma, Duryodhana plans a bigger attack and sends Karna to meet the Matsya army with a fresh reinforcement and launched a fierce attack on them. Karna captured a vast territory once again and took away sixty thousand cattle of the Matsya kingdom. One farmer runs into the palace and informs the prince Uttara Kumara about this attack. Uttara Kumara finds himself helpless, as his charioteer was already killed by Dussasana earlier and his father, along with Kanka has not yet returned from South entrance. At this time, Arjuna (disguised as Brihannala) offers to be his charioteer and leads him to North gate. The episode of Karna capturing cattle at north gate is Uttara GoGrahana. In this war, Arjuna reveals himself and wins the war for Uttara Kumara. Susharma felt insulted, returns o his kingdom and awaits for revenge. He long with his army are insulted by women in his kingdom. 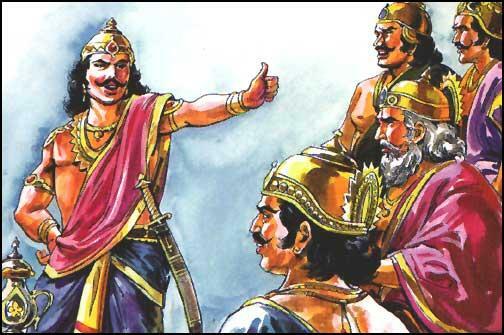 After Bheesham fell down on 10th day, Dronacharya was made commander-in-chief of Kaurava army. Duryodhana asks his guru to capture Yudhishthira alive. Drona did his best and when he was almost about to capture Yudhishthira, army raises an alarm and Arjun blocks his guru’s chariot. Drona, unable to defeat Arjuna before sunset returns without fulfilling his promise. 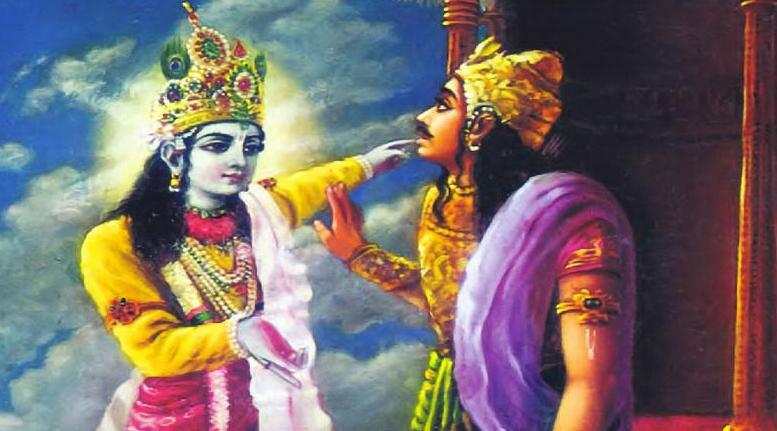 He says to Duryodhana that, Yudhishthira cannot be reached as long as Arjuna is in the battlefield. So, it is important to engage Arjuna or distract him for a day. Hearing this, Susharma volunteers to do this job. He wanted to take revenge on Pandavas, especially Arjuna, who won Draupadi in swayamvar, where susharma failed to hit the fish’s eye with an arrow. Drona warns that facing or challenging Arjuna is equal to suicide. Susharma accepts it and along with his army called Samsaptakas, performs a Yagna, which ends with their own last rites. All of his army has given up the hope of returning alive after challenging Arjuna. Susharma, along with his 5 brothers Satyartha, Satyavarma, Satyavrata, Satyeshu and Satyakarma gets prepared in a special attire for war. Next morning, they challenge Arjuna to fight with them. Arjuna, entrusted the protection of Yudhishthira to Draupadi’s brother, and asks Krishna to drive the chariot towards Akshouhini of Samsaptakas. Akshouhini (अक्षौहिणी), is described in the Mahabharata as a battle formation consisting of 21,870 chariots (ratha); 21,870 elephants; 65,610 horses and 109,350 infantry. Meanwhile Drona tries all methods to reach Yudhishthira, but Drishtadyumna (Draupadi’s brother) blocks his path. Drona, knowing that drishtadyumna was born out of yagna-fire to kill him, tries to avoid him but in vain. Bheema comes up to rescue his elder brother, but Bhagadatta attacks him. Arjuna realizes that his brother needs him and asks Krishna to driver towards Yudhishthira. When Krishna turns the chariot, Susharma’s army raises a war cry. This puts Arjuna under a fix. If he leaves, he will be called a coward for showing his back. If he stays, his brother will be in danger. Sensing Arjuna’s dilemma, Susharma attacks them with 2 weapons. Arjuna nullifies them and retreats him with 3 weapons. He reaches Bheema and upon seeing Arjuna, pandava army regains their confidence. Day 12 ends with heavy losses for kaurava army. Duryodhana blames his guru Drona for this failure. Drona plans Chakravyuha for next day and asks Susharma to keep Arjuna engaged, as he is the only warrior who knows how to enter and exit this spiral plan. On day 13, Susharma and his army of Samsaptakas again challenge Arjuna. While Arjuna is kept busy, Yudhishithira is thrown the challenge of Chakravyuha. When nobody was able to face it, Abhimanyu, son of Arjuna, volunteers to break it. He claims to know the entrance technique, but does not know how to exit. He asks remaining four pandavas to follow him, while he enters. But Jayadratha, who had the boon to block pandavas for one day, stops them from entering the chakravyuh. 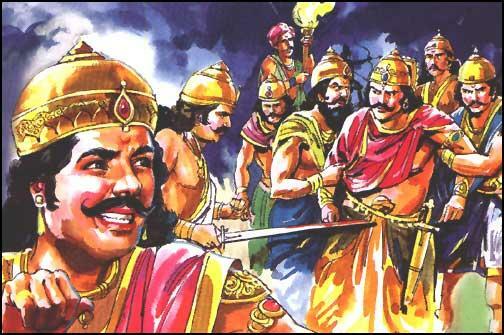 Abhimanyu enters alone and is killed mercilessly by all Kaurava warriors. When Arjuna finishes the entire akshauhini of Susharma and returns, he finds dead body of his son.